The ESL politics vocabulary list on this page will let you learn many words about elections and politics. There is often information about politicians or elections in the news, so understanding politics vocabulary will help you understand the news. This page has a vocabulary list as the first part. The list has lots of words with definitions so you can read what they all mean. 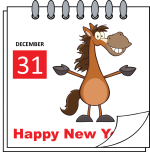 There is also a set of flashcards of the vocabulary that you can download and then a recording of the vocabulary being spoken by a native English speaker so you can hear the correct pronunciation. Identification of definition that matches a word. Identification of word that matches a definition. Identification of word that matches a picture. This list has ESL politics vocabulary words that you should try to learn so you can use them. Each word has a definition as well as the part of speech it represents. Following the list there is a set of flashcards you can download, and then you can listen to the recordings of the ESL politics vocabulary being spoken by a native English speaker. 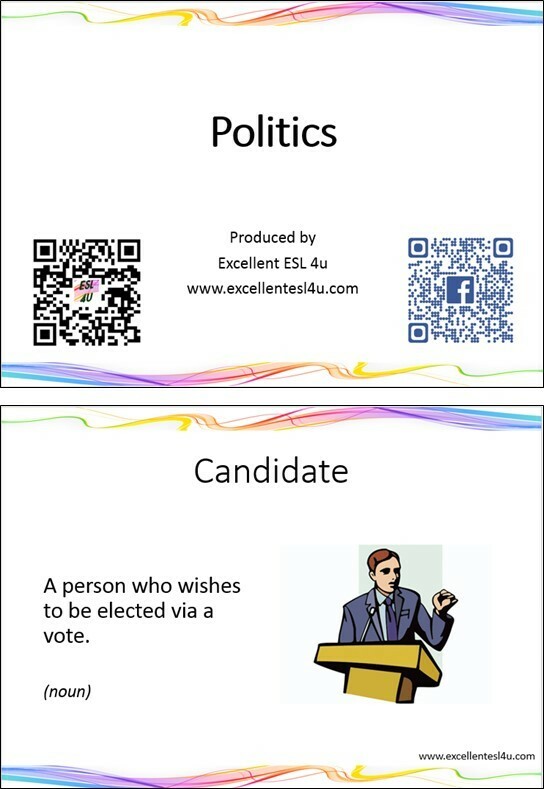 You can download the following set of ESL politics vocabulary flashcards by clicking on the following picture or link. Once you have downloaded them you can use them when you are offline to keep learning the ESL politics vocabulary items. 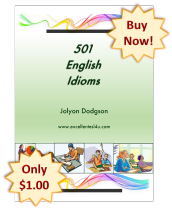 In this part of the ESL politics vocabulary page you can listen to or watch the following two recordings of the words being spoken by a native English speaker. By doing this you will be able to learn the correct pronunciation. The first recording you can just listen to, while the second one you can watch a video and see the ESL politics vocabulary flashcards being shown at the same time as the words are spoken. For this ESL politics vocabulary exercise you need to decide which of the options (A-D) in each question matches the given word. When you have answered all the questions you can use the get score button to see the correct answers. Choose the correct definition for the politics vocabulary in this quiz. 1) What is the definition of Bill? A) A draft from of a law before it has been approved by a vote. B) The container that is used to hold all the used ballot papers. C) A person who wishes to be elected via a vote. D) When two or more political parties work together to form a government. 2) What is the definition of Challenger? A) The elected part of the USA government. B) A conversation between people where they try to convince others that they have the correct beliefs. C) A person who hopes to beat someone in an election. D) A person who is chosen or elected to attend an event to represent a larger group of people. 3) What is the definition of Elect? A) The group of people who are allowed to vote in an election. B) A voting system where the candidate with the most votes is the winner and the losing candidates get nothing. C) The lower part of the British parliament where the elected politicians debate and vote. D) To chose someone using a vote. 4) What is the definition of Independent? A) A small piece of paper that has information printed on it. B) A candidate or elected person who is not a member of a political party. C) A document that states what a political party or government will do. D) A victory that is very large. 5) What is the definition of Policy? A) A plan that a government or political party will follow when in government. B) Information that supports or dismisses a topic that maybe at least partially untrue. C) The process of choosing a leader for a country, and them leading the country. D) A first selection where members of a political party chose the person to stand in an election. In the next ESL politics vocabulary task you need to look at the definition given in each question and decide which option (A-D) matches it. Then you can again use the get score button to check your answers. 1) What is the meaning of the following definition: The person who leads and ensures the functioning of a body of politicians? 2) What is the meaning of the following definition: A group of people with the same political beliefs? 3) What is the meaning of the following definition: To have more than half of something, such as votes or seats? 4) What is the meaning of the following definition: The person that currently holds a (political) office? 5) What is the meaning of the following definition: A gathering of the members of a political party? 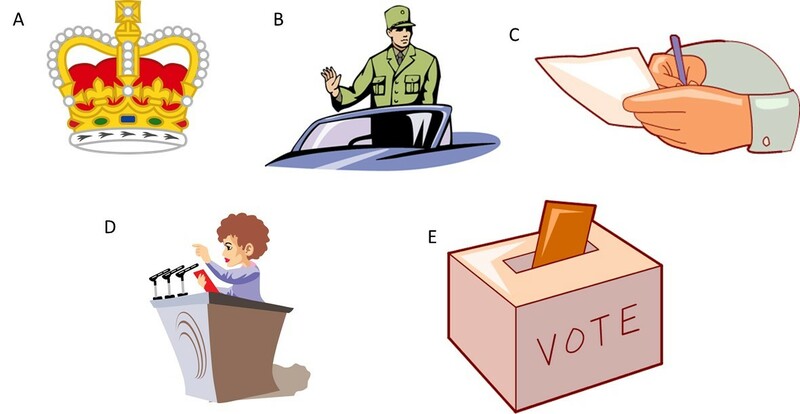 In the last ESL politics vocabulary activity you need to look at the following pictures and then decide which option (A-D) in each question matches the indicted picture. You can see the correct answers by using the get score button that is at the end of the questions.